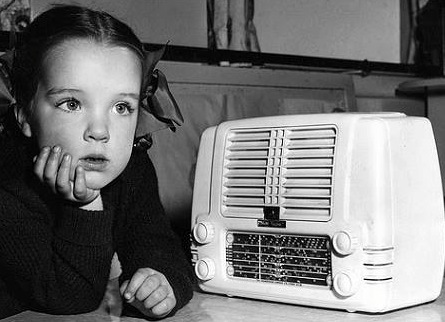 Future for commercial digital radio looks bleak. Cannot match FM. As we reported in August the Hong Kong Digital Broadcasting Corp. applied to return its DAB license to the government, citing “unsatisfactory” developments in the digital radio industry. 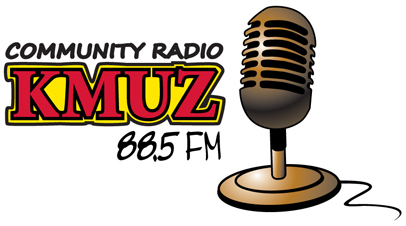 According to the management the move was not due to immediate financial difficulties, but a lack of prospects in digital broadcasting and government policies that failed to help digital radio reach a wider audience, causing difficulties in attracting advertising. Now a third Hong Kong broadcaster gives up on DAB, as Metro Radio returned its DAB licence to the government, ending years of trying in vain to open up a new market – one that nobody really wanted – with little success according to South China Morning Post. Seven out of ten say reject FM switch-off. DAB project close to a fiasco. In an opinion poll on behalf of the national daily Dagbladet the resistance is at its greatest in the three northernmost counties. The switch-off begins in January in Nordland. An overwhelming majority of the people are strongly against closing the FM network and a transition to DAB. 66 percent of respondents said that they were against moving from FM to DAB. Only 17% say they are for this. Dagbladet carried an identical survey in July this year, with almost the same results. Great opportunity for local operators in Norway when state and foreign-owned broadcasters move to DAB. This opening of airwaves will put pressure on politicians to show their cards on the democratic agenda before next years's general elections. When national channels disappear from the FM band next year the vacant frequencies should be used by local radio, says Norwegian Local Radio Association (NLR), which also ask for an increase in subsidies, less detailed regulation of the industry as well as continuity and better overall framework regulation. NLR has recently submitted its comments to the media pluralism investigation committee. Dramatic stand-off in parliament. Labor saved Conservative government from a DAB defeat. But the transition plan is rejected by most Norwegians. Amidst reports coming in from all parts of the country regarding insufficient DAB coverage and other technical problems Stortinget had to decide on two proposals for a postponement of the FM switch-off 2017 or a complete abandonment of the switch-off pan. 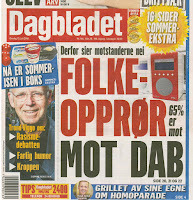 Emergency Authority: Easy to Hack Norwegian DAB Radio. The Norwegian Civil Contingencies Agency (DSB) are sounding the alarm about units in DAB networks can be vulnerable to hacker attacks. Information indicates that it will be relatively easy to produce your own DAB transmitter that can be used to send malicious code to car radios. As DAB radio often is connected to the rest of the vehicle internal network, a hacker can to put key features out of order, said in the report now submitted to the Ministry of Justice. Without emergency alerts via FM, the whole population will not be reached by radio. Now the federal government is looking for new ways to inform in an emergency, such as earthquakes, landslides and floods. According to public radio SRG, digital radio DAB+ is expected to gradually replace FM from 2020. This threatens to become a catastrophic gap for information authorities. Today’s alarm system cannot be used any longer. It is clearly defined in the event of a disaster: When the sirens are heard radio should be turned on. This usually via the major radio channel. If this should fail, there is emergency transmitters. Traditional television is distributed to consumers through various distribution platforms such as cable, satellite and terrestrial networks, and broadband via fiber, fiber LAN and xDSL. In June 2016 there were 5.2 million digital and analog pay-TV subscriptions in Sweden. Of this there were 2.8 million digital television subscriptions, which was an increase of 2 percent a year. Broadband expansion also affects how we receive traditional linear television. The number of subscriptions for IPTV continued to increase during the first half writes the Telecom Authority (PTS) in its report. New services aimed at North Korea, Russia and much more. The service’s Russian-language journalism will be boosted to include extended news bulletins, a relaunched website and more journalists on the ground in Russia. On the Korean peninsula, the BBC will broadcast short-wave and medium-wave radio programs that will allow listeners in North Korea to pick up impartial news. The World Service will also expand its digital services to offer more mobile and video content and a greater social media presence. The World Service will focus particularly on increasing audience reach with younger people and women. Centre Party worry for insufficient DAB readiness. Would allocate NOK 40 million to postpone an unpopular switch-off. Supported by one of the government parties. In its alternative budget for 2017 the opposition Centre Party allocate NOK 40 million to cover the cost of postponing the closure of the FM Radio. - We must postpone the switch-off which will start in northernmost Norway January 11, and then be rolling all over the country during 2017, says Janne Sjelmo Nordås member and Vice Chairman of the party's parliamentary group Senter to the daily Dagbladet. The proposal is linked with an prior motion to postpone the closure. The Culture Committee will decide November 24, following debate and decision in Stortinget - the parliament - on December 6. The Minister of Culture and the conservative party Høyre risk losing, but can be rescued by the largest party. Also for the future in Germany it will be possible to buy an FM radio receiver that is not also equipped for digital terrestrial broadcasting (DAB). The Economy Ministry has now rejected a proposal from the Culture Committee of the Federation Council that the Telecommunications Act should be amended that from 2019, all receivers sold should also be able to receive standardized digital signals. New data from the second quarter of this year shows that a record number of smartphones with their FM reception capability enabled were sold in the U.S. during the period. Since 2012, the broadcasting industry R&D unit PILOT has tracked the sales and FM capabilities of top-selling smartphones in the U.S. This usually equates to around 20-25 smartphone models, representing the lion’s share of U.S. sales during any quarterly period. The European Broadcasting Union has published a document outlining an EU policy and development which can support public service media’s role and contribution to the digital society. Requirements identified by the EBU cannot only be met by technical solutions. A European 5G Policy should reflect a holistic approach says the EBU. 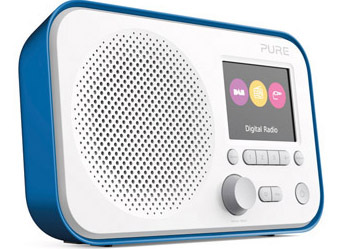 UK digital radio manufacturer Pure has announced the Elan E3, a mid-price table-top DAB+ receiver which contains a 2.8-inch, full-color TFT display capable of displaying the DAB SlideShow service, often dubbed SLS. 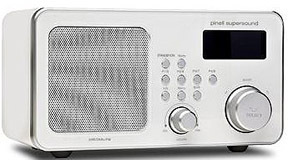 The radio is priced at £49.99 (US $66). This is the first time that a SlideShow-capable digital radio receiver has been available for under £50 and may stimulate UK broadcasters' interest in SlideShow functionality. China digital radio broadcasting in FM band - CDR - is a standard for terrestrial radio that operates in the FM band (87 MHz to 108 MHz). CDR is operational since November 2013 by the authority of State Administration of Press, Publication, Radio, Film and Television of the People’s Republic of China (SAPPRFT). Three trial networks are presently on air in Beijing, Guangzhou and Shenzhen, By the end of 2016, CDR broadcasts will be available in more than 560 cities. Digital Broadcasting Corporation is going off-air and has applied to return its license to the government, citing “unsatisfactory” developments in the digital radio industry. Job losses will total 113. DBC boss Loh Chan said the move was not due to immediate financial difficulties, but a lack of prospects in digital broadcasting and government policies that failed to help digital radio reach a wider audience, causing difficulties in attracting advertising. Overwhelming majority is strongly opposed to a closure of the FM network and a transition to DAB. The public radio channels and the commercial channels in major cities will close their FM broadcasts next year. 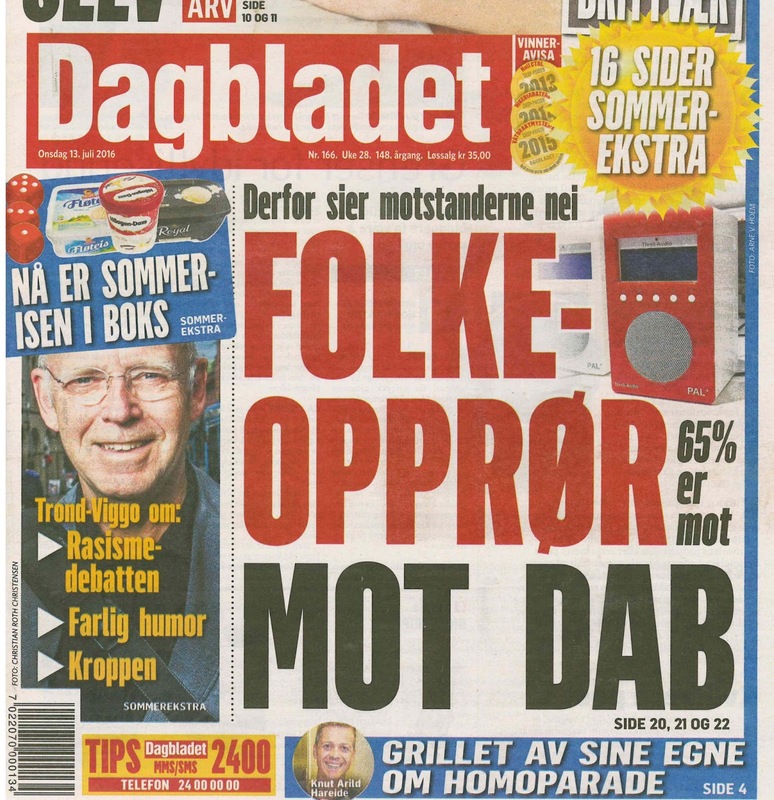 A survey by Ipsos for the daily Dagbladet reveals that an overwhelming majority are strongly opposed to a closure of the FM network and transition to DAB radio. The question: It is decided that the FM network will be switched-off 1 January 2017. After that time must have DAB radio to listen to the radio. Should the FM network be switched-off and radio signals moved from FM to DAB, or are you against it? The results of the survey show that 65 percent opposed a transition, 16 percent positive and 19 percent undecided. Government study regarding a digital transition released. 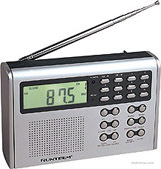 Private radio want transition subsidies and sales ban on FM receivers. Public service not onboard. Community radio: DAB is an outdated technology. 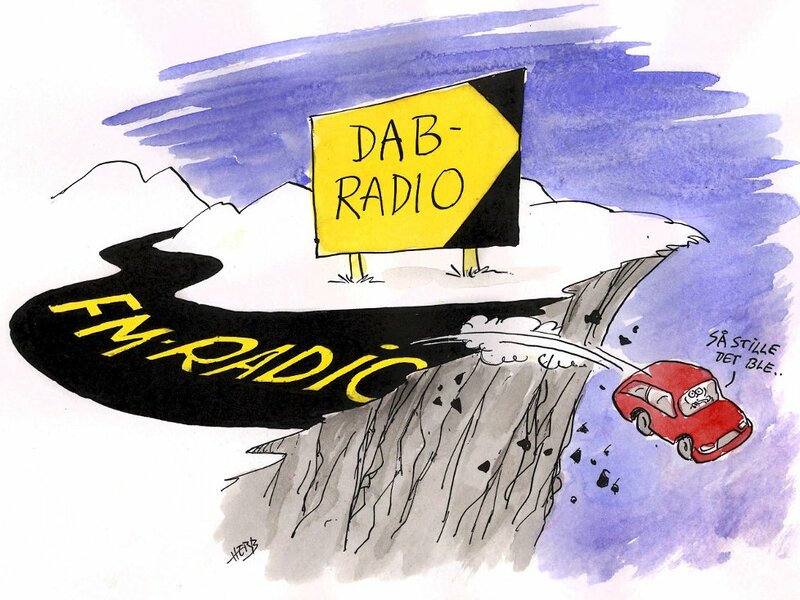 Because the market outlook for terrestrial digital radio in Austria is bad, private radio companies want drastic measures: The sale of non-digital radios should be banned, and DAB+ should be mandatory for all new cars. However, in a study released last week the Austrian regulator RTR gives little hope for a viable development of the digital radio market: In the currently existing framework there are no prerequisites for a profitable business case, according to the document. Government again questioned by the surveillance authority about DAB. The EFTA surveillance authority ESA is not satisfied with the answers they so far have received from the Ministry of Culture regarding DAB. Now there is another ESA letter with several critical issues. Earlier the Norwegian Local Radio Association (NLR) has appealed to ESA because NLR fear that the major players in the radio market, as NRK, P4 and Radio Norway are favored. NLR believes government policy is contrary to EU competition laws. 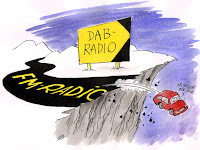 Presently, ESA is handling three different cases regarding the FM to DAB transition in Norway. TDF has launched a two-year joint project called SmartCAST that aims to study and build a long-range broadcast system, with potential interactivity. Transmission of data, including audio, will be based on the Digital Radio Mondiale standard. During two decades there has been heavy lobbying for the DAB technology created for and by the public broadcasting sector. But is there any market for DAB when the world goes on-line? Are the politicians presented with a distorted picture of an outdated technology? 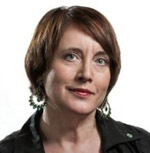 Is the credibility of the public broadcasting sector at risk? These are some of the questions asked in a critical memorandum The Illusions of The DAB Radio World today released by the Public Service Council (PSR) in Sweden. Mobile operators probably not subsidising smartphones with DAB+. The Swiss radio station my105 in Zurich decided for strategic reasons to completely rely on online and thus to dispense with the terrestrial broadcasting via DAB + in the German-speaking Switzerland. Many discussions, experience and surveys of recent months have shown that "DAB-proliferation is overrated". In the case of my105 still would mean that DAB+ is not useful for the radio station with its 10 channel multi-channel strategy. At least three commercial radio stations have now abandoned DAB+ since 2014. A paradox: Can a smartphone online get five-to-twelve-rescue for DAB? The first smartphone that can also receive DAB radio in addition to FM and online was presented at the Radio Days conference in Paris launched its first. LG Stylus 2 is really a "phaplet"- which in size is something between a mobile and a plate. On this one you should be able to listen seamlessly to hybrid radio - a radio channel that automatically switches between DAB + or FM and Internet depending on varying reception conditions. But experts are wondering whether there is a sufficient market for this because DAB is only in operation in few countries on a global scale. Public service company ORF has no interest in DAB + according to the media authority KommAustria. 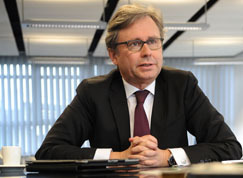 If we cannot increase program output DAB is useless to us, says ORF Director-General Alexander Wrabetz. ORF With current legal regulations ORF will not be able to establish more channels, DAB+ has not been successful in any European country, and the technology behind DAB+ is 30 years old. There are 15.5 million FM receivers in Austria, making a transition difficult and a forced solution can compromise the radio medium. This was the basic criticism Wrabetz has submitted to KommAustria. Further for ORF, a transition cost for parallel operation DAB+ and FM another EUR 50 million per year, says the public service boss. CBS plans to sell one of its legacy brand CBS Radio. We will begin to explore strategic options, CBS Chairman and CEO Leslie Moonves announced today during the company's investor day. The move represents a recognition that terrestrial radio is no longer a growth industry, particularly as major advertisers shift their spending to digital platforms according to Los Angeles Times.